The Truck-Safe is the the world’s first automatic load securing system for truck and trailer. It replaces manual work of lashing cargo with belts and ratchets. Once the cargo is automatically secured the system is monitoring the tension and is able to readjust the tension as necessary. On behalf of the Truck-Safe consortium Estonian Innovation Institute (EII) developed the world’s first fully automatic cargo securing system for trucks and trailers. The system includes a combination of mechanical and electric components as well as an electronic control unit with an advanced but rugged sensor network. Several prototype iterations were developed over a 2 years’ time frame and the first commercial Truck-Safe systems hit the roads in 2016. A major advantage of automatic cargo securing is the timesaving for the user. Automatic trailer loading systems are wide spread and can fill a trailer within a few minutes. With the Truck-Safe system the cargo no longer needs to be secured by hand, which otherwise can take anywhere between 30 and 90 minutes. Only with the improved speed of an automatic cargo securing operation the full benefit of an automatic loading system can be realised for the truck owner or hauler. The Truck-Safe system is providing continuously supervision of the lashing forces and will re-tensions automatically when needed. It also will alarm the operator on sudden loss of tension both while on the road and while standing. 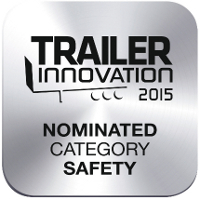 Truck-Safe has won the third place for the Trailer-Innovation 2015 award in the category Safety.